See the picture below. 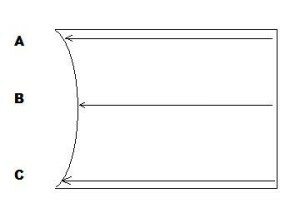 If a window is “bowed,” dimensions A B and C will not all be the same. 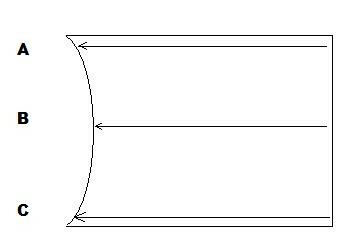 Therefore if you only take measurements A x C and order a window based on those measurements it will not fill. The new window will always come out perfectly square and will not fit into this hole, it will bang on the sides. You might even scratch your head and take the replacement window measurements again, to find that it should fit but it still won’t. So you need to measure the window in three different places to make sure it isn’t bowed. You can also have corners that bow out too so be careful. I realize this is an extreme example but beware, even a small difference will wreak havoc on your new window. It may fit in the hole, but when it comes time to adjust it, you won’t have any room for adjustments and will be unable to get the window to work properly. Always measure the window opening in three different places (at a minimum) to ensure proper fit, and of course always use the smallest measurement as your rough opening measurement. Remember you are only measuring for existing opening right now. While you are taking your replacement window measurements don’t try to make deductions in your head and then right them down. Take all of your measurements as existing openings then go back and make your deductions. Installers who measure 20 windows every day of their lives for the past 20 years even make mistakes, so stick to one thing. If you are afraid you will make math mistakes after you have written your replacement window measurements down, feel free to make the deductions now and write down the window size, just make sure that whatever you do, write them down all the same, don’t use window net frame size sometimes and existing opening size at other times. Stick to one way of doing it throughout. So now that you have your existing opening, what deductions are you going to make? Good question, go on to the next section and you will learn how.